A British Humanist group began their “Atheist Bus Campaign” yesterday, and within 10 hours reached their funding goal through online contributions. 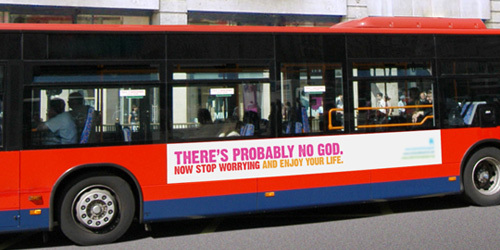 With donations being collected by The British Humanism Association, the group plans to run bus side advertisements in London, identical to the one pictured above. With the rapid success of the campaign, the Atheist Bus Campaign hopes to raise enough money to include in-bus advertising as well. By promoting the concept of atheism and encouraging atheists to go public with their beliefs, it is not surprisingly this advertising campaign has its critics. In spite of the campaign’s opposition, it is being welcomed by an unexpected source. the Methodist Church said it thanked Professor Dawkins for encouraging a “continued interest in God”. Atheism is hotly contested as a spiritual choice, however we embrace it, along with all other religious theology here at the ULC Monastery – we are all children of the same universe.